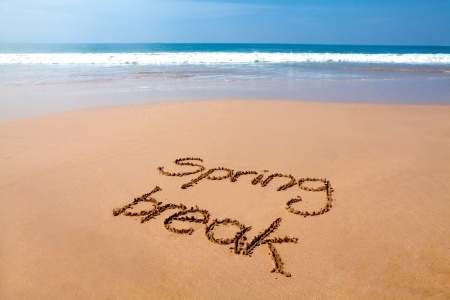 Getting ready for spring vacation or a tropical getaway? Lazy days by the pool or at the beach are in our immediate future and we can’t wait for some one-on-one time with the sun. Before we throw on our swimsuits and hit the beach it’s important to remember that our skin has been in hibernation all winter long and may need a little extra attention as it gets acclimated to the new temps and UV rays. Here’s how to make sure you go home with a healthy glow instead of a painful sunburn, skin bumps or even a breakout. We’ve said it before; we’ll say it again. The number one rule in skincare is to never forget your sunscreen, rain or shine. When your skin has been hiding under layers of clothing all winter, it needs a little extra TLC. Lather on that sunscreen, and make sure it’s broad-spectrum, like our Prevention+ SPF 50. This stuff is so lightweight you won’t even feel it, but it’s packed with tons of sun-fighting ingredients like zinc oxide and plant-derived stem cells. If you’re planning on showing off your fun adventures on Instagram with tons of glamorous selfies, you may want a little coverage to even out your skin tone and give you a natural glow. Try our I Conceal Flawless Foundation for a natural flawless complexion at the beach. It not only gives you an effortless coverage, it also nourishes your skin with botanical ingredients. If you’re already prone to breakouts, your skin may react to the sun by bringing some very unwanted pimples. Prevent a looming breakout by washing your face morning and night with a medicated wash. We recommend a cleanser with salicylic acid to gently remove makeup while exfoliating the skin. This is also a great wash for oily skin types even if you don’t experience many breakouts! Just remember, if you are using this cleanser, it’s even more important to keep your skin protected in the sun. Keep a fresh layer of sunscreen on, and your face will thank you later. While you’re getting plenty of water time at the pool or beach, it’s just as important to keep your body hydrated by drinking plenty of water. Keeping your body hydrated from the inside out will prevent your skin from reacting badly to the change of scenery and environment. If you’re bored of plain old water, try adding some fresh lemon or lime. Or mix things up by experimenting with different fruits and flavors! Follow these steps, and your skin will be just as happy as you are on your spring vacation.